See cities in a new light – by their color schemes. 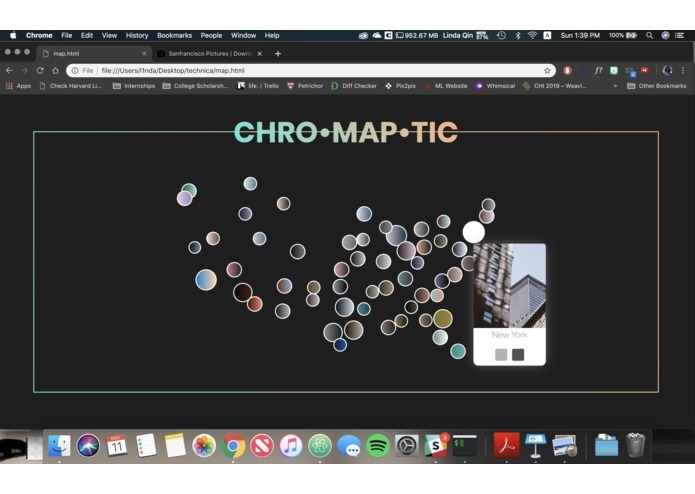 Chromaptic is a visualization of the color schemes that best represent cities in the United States. The program parses photos from different cities posted to Unsplash into the Clarifai API, to return the dominant color of the photos, which are then visualized on a map. Users are then able to hover their mouse over the map markers to get the name of the city, the color palette, and preview one of the photos that was used to determine that city's color. The motivation behind this hack was to determine if there exists a color that best represents a geographical location. Where are the real amber waves of grain/purple mountain majesties? Is Los Angeles more blue? Is Phoenix more orange? How does color scheme potentially affect mood, and is it able to predict trends across geographical regions? First, we utilized the Unsplash API to search for photos by keywords to get the photos tagged with each city. Then, those photos were run through the Clarifai API, that offers image and video recognition as a service, to get predictions of the dominant colors in the images. These colors were then used to create a gradient bubble whose size is proportional to the city's population, that marks the city on the US map. We utilized cities.json, which provided data on the top 1000 cities in the US, to create the map and its elements. I worked on the front end and data visualization using D3. I also spearheaded the computer vision portion of obtaining the data points for color schemes from our dataset of photos and the Clarifai API.